St. Martin's Griffin, 9781250054500, 384pp. From the ballrooms and mansions of Denver's newly wealthy, to the seamy life of desperate women, Fallen Women illuminates the darkest places of the human heart. It is the spring of 1885 and wealthy New York socialite Beret Osmundsen has been estranged from her younger sister, Lillie, for a year when she gets word from her aunt and uncle that Lillie has died suddenly in Denver. What they do not tell her is that Lillie had become a prostitute and was brutally murdered in the brothel where she had been living. When Beret discovers the sordid truth of Lillie's death, she makes her way to Denver, determined to find her sister's murderer. Detective Mick McCauley may not want her involved in the case, but Beret is determined, and the investigation soon takes her from the dangerous, seedy underworld of Denver's tenderloin to the highest levels of Denver society. Along the way, Beret not only learns the depths of Lillie's depravity, but also exposes the sinister side of Gilded Age ambition in the process. 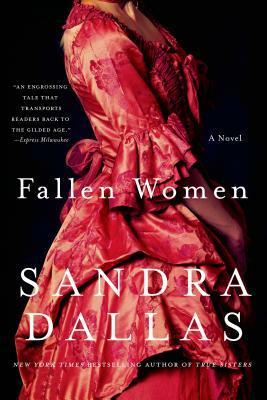 Award-winning author Sandra Dallas was dubbed “a quintessential American voice” by Jane Smiley, in Vogue Magazine. She is the author of The Bride’s House, Whiter Than Snow, Prayers for Sale and Tallgrass, among others. Her novels have been translated into a dozen languages and optioned for films. She is the recipient of the Women Writing the West Willa Award and the two-time winner of the Western Writers of America Spur Award. For 25 years, Dallas worked as a reporter covering the Rocky Mountain region for Business Week, and started writing fiction in 1990. She lives with her husband in Denver, Colorado.